Students are encouraged to apply for academic honors. Announcements are made when applications are available. There are four Honor Societies within the school. The first three have membership based on achievement in the curriculum course offerings for the current school year. 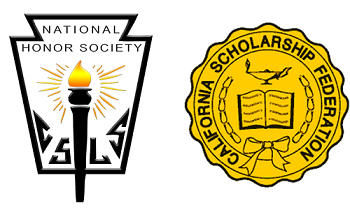 The National Honor Society (NHS) is a nation-wide organization. This society is composed of sophomores, juniors and seniors who have achieved a cumulative un-weighted 3.5 GPA and who have demonstrated leadership, service, and character throughout their high school experience. Students must apply for membership and are chosen annually by a designated faculty committee in accordance with the by-laws of NHS. A special induction ceremony takes place once a year in the fall semester. Membership is for life. The California Scholarship Federation (CSF) emphasizes high standards for scholarship and community service for California high school students. Founded in 1921, the CSF is the oldest scholarship institution in the state of California. Our chapter number is 409 SC. Membership in the organization is attained by earning 10 CSF points. An explanation can be found on the application form for CSF, which is available from the Counseling Office.